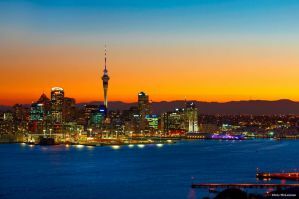 Auckland is the largest city in New Zealand and is often the entry point for travelers to the country. It is located in the northern half of the North Island and sits on a narrow isthmus that connects the Northland Peninsula with the rest of the island. Auckland has some nice hostels that offer social environments and fun activities. If you're traveling alone, or even if you're traveling with friends, hostels provide a fun environment where you can make some new friends. How much do hostels in Auckland cost? A good hostel for solo travellers, couples, families, and small groups. Haka Lodge is a fun place to stay in Auckland, New Zealand that appeals to all types of travelers. There are a wide variety of room types available including private rooms with private bathrooms, family rooms, and even a large dorm that sleeps twenty, for people on a particularly tight budget. Smaller dorms are also available if you want to save money but not share a room with 19 strangers. There's a female only room that sleeps five as well as co-ed rooms that sleep five, seven or eleven. The two family rooms have a large queen sized bed and a set of bunk beds, so they're perfect for families with kids. The hostel also has all of the standard amenities including free wi-fi, lots of natural light, and any travel information that you could need. There is also a shared kitchen available to guests and a lounge area where you can relax. The atmosphere is social and mellow and the staff are friendly and helpful. This is a great place to stay in Auckland. The hostel has a great atmosphere that makes the experience fun. Oaklands Lodge is conveniently located in the middle of Mount Eden Village. It's near many great cafes, restaurants and bars and is surrounded by a quaint neighborhood that offers views of the city below. It is a little bit outside of town, and it takes about 20 minutes by bus to reach the city. The Lodge has a unique Victorian style that will quickly begin to feel like your home away from home. The hostel has a relaxing atmosphere and while the staff encourages interaction between guests, this is definitely not a party hostel. You can enjoy any of the laid back activities that they plan. These often include meal nights, movie nights, and trivia nights. They also have a lot of interaction between their sister hostel, Bamber House, and there are frequently barbecues and sporting games between the two hostels. A good hostel for couples, solo travellers, female travellers, and small groups. The Attic Backpackers is conveniently located in the middle of Auckland. It's just a block from the famous skytower and is a short walk from the famous Queen Street. If you want to be in the middle of the action, then this is the place to stay. The hostel is very clean and modern, and the staff is friendly and welcoming. It's a great place to base yourself during your time in Auckland. The hostel has several great common areas where guests can hang out. On the top floor there's a large covered deck where you can relax. There's also a fully stocked, shared kitchen and a nice dining area. The hostel also has all of the standard amenities and as well as a travel desk where you can book any number of activites, transportation, or tours. Single, double, and twin private rooms are available. There are also dorms that range in size from four beds to twelve beds, depending on your budget and preference. A four bed female only room is also available. Comparable to it's sister hostel, Oaklands Lodge, Bamber House is also found in the suburb of Mount Eden. It's a half hour walk, or short bus ride to town. It's surrounded by great local restaurants and cafes, and this is a nice place to stay if you want to see a different side of Auckland. It's still close to many sights and attractions, but it's a quiet and pleasant neighborhood with a lot to offer visitors. The hostel is very friendly and comfortable. There are both dorms and private rooms available as well as several large common areas. You can enjoy a log fire or relax in the hostel's large garden. The staff can also help you arrange any activities, transportation or short tours you might be interested in. The hostel also regularly hosts activities for guests. These include movie nights, pub crawls, and bowling nights. There are also board games and a book exchange available to guests.